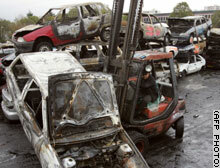 Cars burnt in riots in Paris suburbs are taken to a breakers yard. Would the recent violence across France influence your decision to visit the country? PARIS, France (CNN) -- Following 11 days of violence that have rocked France, Prime Minister Dominique de Villepin said Monday that the government will deploy more police and will take the unprecedented step of allowing mayors to declare curfews in French cities. In addition, in an interview on the private TF1 channel, de Villepin said that France must do more to empower the mayors of its cities, provide training, especially for those who drop out of school, and create a climate that puts an end to discrimination. De Villepin's remarks came on a day marked by the first death caused by the violence. Jean Jacques Le Chenadec, 61, a resident of the Paris suburb of Stains in the region of Seine-Saint Denis, died from injuries suffered outside his apartment building Friday night, a ministry spokesman said. He had been hospitalized in a coma since the attack. The violence has spread to poor neighborhoods across France, shocking French society. "The response of the government is firmness," said de Villepin. He said that Monday night 8,000 police backed up by 1,500 reserve police will be deployed to quell the violence. De Villepin said that so far more than 1,200 arrests had been made. He blamed some of the violence on "criminal networks" but said much of it was carried out by "gangs of very young youths" who feel they have suffered discrimination and depravation. In addition, said de Villepin, acting under a 1955 law, city leaders would be able to "apply a curfew to ensure a return to peace and calm." Asked who was causing the violence, the prime minister responded, "They are delinquents." De Villepin said young people in France, 57,000 of whom are on the rolls of the long-term unemployed, "must be given hope." He said the government had a three-point plan. The first point, he said, was to empower mayors who had seen their authority eroded so that they "have the authority to restore order." In addition, he said, training must be provided so that at 14 children who no longer wish to continue in the school system can be trained to find jobs. "I hope that we can meet them, assess their situation, and within three months offer a contract for training," said de Villepin. "Everyone must find a solution." De Villepin said he doubted the troubles could be blamed on the French government attitude towards Islam and the French law forbidding Muslim girls to wear veils in public schools. "Discrimination is the last point we must not ignore," said the prime minister. In conversations, young people from France's poor suburbs told of suffering from feeling different, he said. "We must struggle against discrimination," he said. "Everyone's behavior must change. ... We must have a welcoming republic where everyone must be respected." The riots began after two youths of North African descent were electrocuted when they hid in an electric power station, believing they were being followed by police. De Villepin said he had spoken with the families of the youths and had promised them transparency in the investigation. He said that early indications were that police were not following the two. He said the investigation was continuing but that it was certain that a nearby mosque had not been targeted by police. Damage from protests across France hit a new peak overnight, as rioters burned 1,408 vehicles in 274 towns, France's national police chief said. More than 4,300 vehicles have been burned since the riots began 11 days ago. The figure was an increase from the night before, when 1,295 vehicles were burned, Michel Gaudin told a news conference. He said that police made 395 arrests overnight Sunday-Monday, up from 345 the night before. Ten riot police were injured by youths firing fine-grain birdshot in the southern Paris suburb of Grigny, national police spokesman Patrick Hamon said. Two were hospitalized but their lives were not in danger, he said. It was the first time police were injured by weapons fire since the unrest started. "We are witnessing a sort of shock wave that is spreading across the country," Gaudin said, noting that the violence appeared to be sliding away from Paris and worsening elsewhere in France. The list of cities attacked is growing -- from Lille in the north to Rouen and Orleans in the west, to the Mediterranean cities of Nice and Cannes, to Strasbourg and Colmar in the east, with youths attacking shops, schools and a police station. CNN correspondents have said renegade youths have turned neighborhoods into no-go zones, even in the daytime. Among the worst incidents reported -- rocks thrown at two buses hit a 13-month-old child in Colombe, an official with the Interior Ministry said. 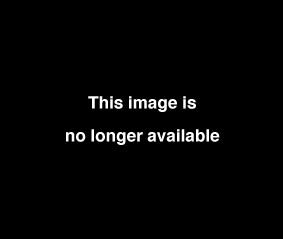 The child was in serious condition. In the northern city of Rouen, a police barricade was set afire and a burning car was pushed into the police station; and in Strasbourg, near the German border, a school was torched. A church was set ablaze in the southern fishing town of Sete and another in nearby Lens, Pas de Calais; two schools in the southeastern town of Saint-Etienne and a police station in the central France town of Clermont-Ferrand were torched, as was a social center in the Parisian suburb of Seine-Saint-Denis. The spreading violence has shocked national leaders and community residents into action, with mediators and religious leaders talking to the youths in an effort to stop the violence. The Union of French Islamic Organizations (UOIF) condemned the disorder and destruction the riots had caused. Australia, Austria, Britain, Germany and Hungary advised their citizens to exercise care in France, joining the United States and Russia in warning tourists to stay away from violence-hit areas.